Memory is the faculty of the mind by which information is encoded, stored, and retrieved. Memory is vital to experiences and related to limbic systems, it is the retention of information over time for the purpose of influencing future action. 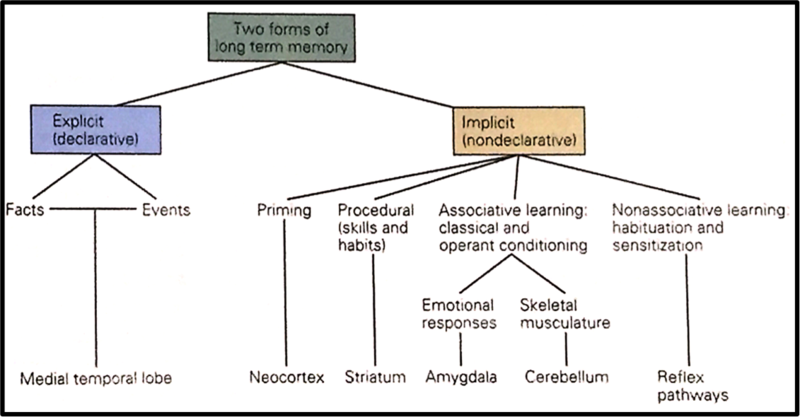 It can be broken up into two broad categories: explicit or declarative memory, and implicit or non-declarative memory. Multiple subcategories exist within these two broad umbrellas, and all of these types of memory are crucial components of everyday life. Different regions of the central nervous system are known to be responsible for specific types of learning. Not pictured in the diagram above, is working memory and short-term memory - two related, but distinct constructs that are thought to be mediated by the prefrontal cortex. Short-term / working memory and long-term memory are the most crucial constructs for life in today's the. The ability to manipulate a multiple things simultaneously, and to retain and effectively retreive these memories over a long period are hallmarks of intelligence. It is important to note that teasing apart these memory constructs is heavily dependent on attention. As the ability to attend to something has a massive impact on how it is encoded in short and long term memory. The more attentive and aroused you are during the learning period, the better you will learn (for the most part). This is referred to as attentional control. Name-to-Face Recall: The target faces presented in the Face Presentation task are displayed on the screen one at a time. Below each face is a list of 4 forenames and a list of 4 surnames. Participants use the mouse to select the forename and surname that they think were associated with each face at the beginning of the session. Numeric working memory: A series of numbers are displayed on the screen, one at a time. Participants are required to try to memorise these numbers as they appear. Once the series is complete, numbers will be displayed one at a time and participants are required to indicate if each number was presented in the previous list or not. Rapid Visual Information Processing (RVIP): A series of numbers are displayed individually on the screen in quick succession (at a rate of 100 numbers per minute) and participants are required to respond when they see 3 odd numbers in a row or three even numbers in a row. Word Recall: A list of words is displayed on the screen, one word at a time. The number of words, the rate at which they are displayed and the interstimulus interval can be modified. Participants are given 60 seconds to write down as many of the words they were shown earlier as they can. This task can be performed immediately following presentation of the words (Immediate recall) or following a delay (Delayed recall). Reaction time Reaction time to various stimuli can be measured in order to measure attention and arousal. There are not many high quality tools available to the average person dedicated to measuring their own cognition. We recommend the Cambridge Brain Sciences platform. Nootropic combinations such as L-theanine and caffeine, bacopa monnieri, and others have been shown to increase performance on many memory testing tasks. Buffalo, E. A., Bellgowan, P. S., & Martin, A. (2006). Distinct roles for medial temporal lobe structures in memory for objects and their locations. Learning & Memory, 13(5), 638-643.